Arrived to 5766 Silverado trail, the glorious entrance doors opened and we were inside. As we entered, the busy Silverado Trail was left miles away, and we found ourselves surrounded by hills which carry vineyards on their lap. We decided to enjoy the landscape after tasting, since I was very curious about the wines (of course I didn’t know that we will be enjoying the vineyard view from the tasting room). Just a quick introduction of the winery, so you can understand why I was so curious about it. Stag’s Leap Wine Cellars is in Napa Valley since 1970 and they are producing mostly Cabernet Sauvignon, by simply respecting their historical vineyards. The winery won its reputation by winning the Judgment of Paris in 1976. 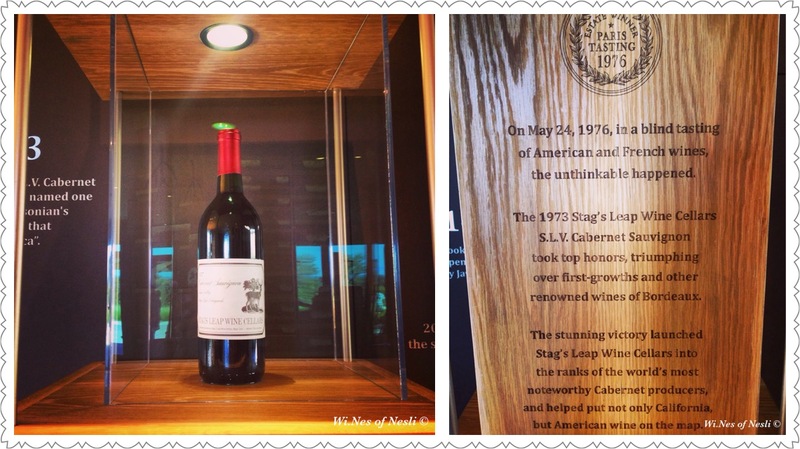 In the entrance, there is a showcase in which you can see what Stag’s Leap Wine Cellars are proud of the most: their history, their soil and their 1973 S.L.V Cabernet Sauvignon wine that won the 1976 Judgement of Paris. The tasting room is full of light and purely shows the breathtaking view of the vineyards (later we were informed that, in 2014, it was designed by Barcelona based architect Javier Barba). While I was still focused on the view and beauty of the place, we were introduced to Ed Ohde, the guest services representative, who was going to host us for the tasting. Soon, I was going to understand how lucky we were to have him during the tasting. 1: Chardonnay Arcadia 2014. The production style of this Chardonnay is similar to Chablis. This wine was fermented in barrels and aged sur lies in French oak barrels for 8 months. I don’t like oak soaked Chardonnays, so I liked this one; first the flower and fruit aromas show themselves and later on, the oaky aromas follow them. This is how it proved its elegancy, to me. 2 and 3: Fay 2013, which is 100% Cabernet Sauvignon. The grapes of this wine comes Fay vineyards, which is the first bought block of the property. This vineyard is dominated by alluvial soil. Following wine, S.L.V. 2013, also %100 Cabernet Sauvignon, but coming from S.L.V vineyard, which is dominated by volcanic soil. The production method of these wines is almost the same; this makes it possible to express the characteristics of the soil. Here, Ed asked me: What do you think about the wines? Me: I am impressed with the expression of the terroir. Fay caught me with its fruity aromas and soft texture in the mouth. On the other hand S.L.V. has completely different style with black fruit and spicy aromas and stronger body. Ed: Well, if you ask me to describe these wines, both made of Cabernet Sauvignon grapes, I would characterize them like following: if FAY wine is Taylor Swift with its freshness and fruit aromas, while S.L.V wine would be Angelina Jolie with its velvety texture in the mouth. Me: (Laughing) I completely agree. I would like to blend these two wines though, the result would be curious. Ed: So, just wait the next wine! 4: The signature wine of the property CASK 23, which is a blend of grapes coming from FAY and S.L.V. vineyards. In vintage 2013, the percentage was 45-55 respectively. It is a harmonious blend and it would be a pity to leave it on the glass, so I just drank it all. I totally agree with Ed that the correct prescription for this wine would be “yummy”. Ed: So, now you will ask me, if FAY is Taylor Swift and S.L.V is Angelina Jolie, what would be CASK 23? To me, this wine characterizes my wife. It has the beauty and it has my love. 5: S.L.V. 2005. Gave us the example of how well it can age this wine. 6: Artemis 2013.cabernet-sauvignon 95% Cabernet Sauvignon, 4% Merlot, 1% Malbec. Wine from their Napa Valley Collection, in which they are trying to obtain consistency every year, while in other wines we are open to differences caused by characteristics of the vintage. Perfect hosting. They are doing their best for you to feel comfortable from the beginning until the end. Good wine. Perfect for my taste: not highly extracted, perfectly-riped (not over-riped) fruit aromas, complex. Obviously well produced and well categorized according to their style. Ed Ohde. He knows how to describe the wines in a clever way and I like his style to characterize the wines in a way that everybody can understand. Wine is a drink, which becomes important to you, only when you understand why and how you should appreciate it. And Ed helps people to appreciate it. Respect to soil. They produce 2 completely different wines, with the same variety from the same geographical area, only by emphasizing the type of the soil. History behind. It is so called “New world”, but they already left behind almost 50 years full of winemaking. Previous Post SUMMER, WINE, PARTY! What a great article! We live in Napa with over 500 wineries but Stag’s Leap is still one of our favorites. The location is beautiful of course but the wines are very good. I enjoy your other blog articles as well. Thanks for sharing! You may like our wine country blog at http://www.topochinesvino.com. Follow us if you like what you see. I will do that, thank you! 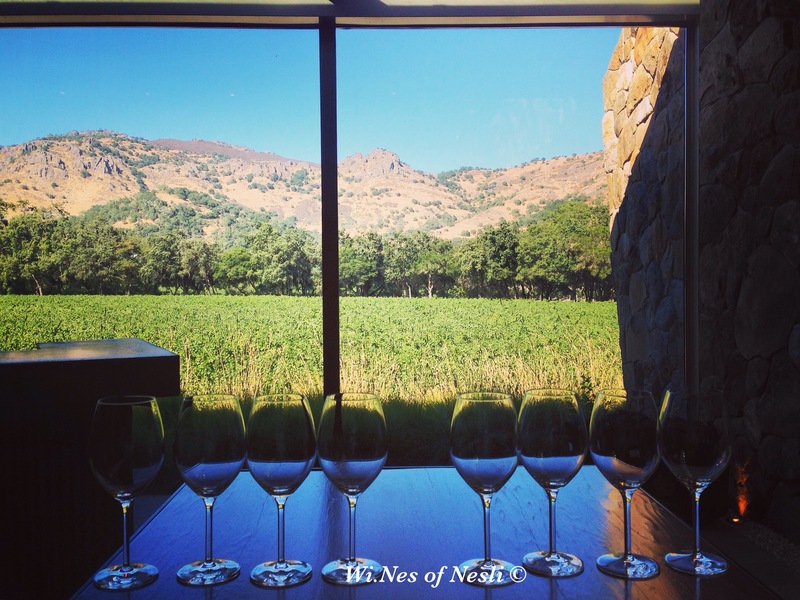 Do you have an article about your favorite wineries in Napa? Thank you! I am very glad that you liked it.